In my last musings, which was the seventh in this series on Dharma Vahini, the most important point I made was with respect to the distinctive roles played by men and women in the larger scheme of sustenance of Dharma in Creation. A clarification relating to the gender issue became necessary for the following reason. You see, by itself, the Atma is far beyond Creation and therefore on the face of it there is no meaning in bringing the gender issue where the principle of Atma Dharma is concerned. However, as explained earlier, at the practical level there is the issue of how people in different circumstances actually observe Atma Dharma in daily life. That is to say, how, for example, does a policeman, a teacher, a judge, a soldier, an administrator etc. apply the principle of Atma Dharma in practice? Extending the idea, a similar question arises in relation to men and women as well, and that is how the gender issue comes up. Clearly, there have to be and indeed there are distinct rules for men and for women. I did not get side-tracked into those details; instead, I decided to offer comments on certain aspects that seldom receive attention. I pointed out that while at the highest level, that is to say BEYOND Creation, there is only Pure or Absolute Consciousness. In Creation or the Universe in which we all live, Divinity has two distinct aspects, namely Divine Consciousness and Divine Energy, symbolised respectively by Shiva and Parvathi. That said, it is clear there is present in every individual, irrespective of gender, both the Shiva as well as the Parvathi aspect. You may remember that I told you that this so-called “joint representation” is called Ardhanareeswara. Nevertheless, at the biological level we do have males and females. So we have this apparently strange phenomenon of distinct males and females at the biological level, and yet at the spiritual level, both of men and women have the Shiva as well as the Parvathi aspects in them. I tried to explain why this is so and how this coexistence of Cosmic aspects operates in practice. Stage 1, Brahmacharya – the young man studies scriptures with a Guru, gets initiated into the Gayatri, and meditates intensely on Brahman or God. Stage 3, Vanaprastha - the couple having reached old age, and their children having grown up and entered family life themselves, retire to the forest. What it really means is that they substantially decrease their attachments to things both material as well as family, thus mentally preparing to focus more and more on God and seek to merge with Him when the time comes. After all this, comes Stage 4, when the man becomes a complete renunciant; this is technically described by saying that the man embraces Sannyasa. As a Sannyasi, the man leaves home and, wandering in the world, makes the entire world his home. He is supposed to have absolutely no attachment of any kind, including to his wife and children. You will notice that these four stages are described in terms of what the man would do in various stages of life. This should not be seen as putting women down and giving them an inferior place. What these four stages mean for women was also codified. However, since my knowledge of that is limited, I am leaving all those details to be described by women scholars, who, I hope would take up the issue later. Seen from the perspective of today, all this partitioning or structuring, whatever you call it, and the prescriptions meticulously laid down for each stage might seem odd, meaningless and even wrong. I submit, however, that we should not rush to judge the life style of people who lived four thousand years ago. More important are the questions: “What is the fundamental basis for structuring such a four-stage road map for life? Does that fundamental basis have any relevance still? If so, how?” The answers to these questions have been spelt out by Swami Himself, and that is where the Purusharthas enter the picture. The word Purusharthas roughly means the legitimate objects of human endeavour. This, by the way, is the interpretation given by Swami Himself in an amazing Discourse given way back on 14th July, 1966, while declaring open the Prasanthi Nilayam branch of the State Bank of India. Scholars define Purusharthas as “the attainment of the state of Brahman”. Are the two meanings given here contradictory? Not at all, and that is what I shall take a few minutes to explain at this stage. Swami has told us on innumerable occasions that God has blessed us with the human form for the special purpose of using it as best as we can to get back to God real quick. As He often tells His students: “From God we have come and to God we all must return; the human body is given to ensure precisely that, by engaging in right action”. Dharma Vahini is nothing but a detailed elucidation of what is meant by right action. The question now arises: “It is all well to talk about right action, but in life one is young to start with; one then enters adulthood, after which comes middle age followed by old age. Clearly, actions would have to suit the age of the person; so how about a road map that one must follow?” The Purusharthas answer precisely that question. The Purusharthas spell out a simple four-point formula made up of four keywords. They are: Dharma meaning Righteousness, Artha meaning Wealth, Kama meaning Desires, and Moksha meaning Liberation. What I have given are the literal meanings of the four words that make up the quartet known as Purusharthas. More important is the sequence in which the four words appear. Let us start with the first and the last words. The first word is Dharma, and it has been given the first place to strongly convey that no matter what one does at any stage of life, it must always be based on Dharma, period. No ifs and buts, and no exemptions under any circumstances. Similarly, the last word Moksha implies that at every stage in life, one must NEVER lose sight of the purpose of life, which is to march steadfastly towards God. In turn this means that one must progressively become more and more detached. What about the other two words tucked in between, namely, Artha and Kama? Well, the ancients said that while one is leading the life of a householder that is as a Grihastha, one cannot avoid seeking wealth nor be totally free from desires, material, physical and emotional. However, neither the quest for wealth nor desires must ever become an obsession and dominate life to the point of a) abandoning Dharma and b) forgetting that one must progressively sublimate desires and attachment. This is the way to make sure that the journey to God gets accelerated. I would not be surprised if all this leaves you a bit dazed. Sorry I have had to pack in a lot of material in this talk, and so maybe I go over all that once more. I began, if you remember, with some remarks on what exactly the adherence to Dharma means explicitly for men and women separately. In doing so, I was not seeking to open up the gender issue; instead, I carefully mentioned that the Swami’s specific advice to women would hopefully be dealt with in a separate series. Sticking to a broader perspective, I then pointed out that in Creation, the Divine aspect manifests as two apparently distinct and complementary aspects, namely, Divine Consciousness and Divine Energy. I added that traditionally, Divine Consciousness is identified with Shiva [supposed to represent the male] while Divine Energy is associated with Parvathi [who represents the female half of Creation]. Drawing attention next to the folklore about Shiva and Parvathi, I explained that young people were not expected to rush into marriage, driven purely by physical instincts. Instead, adolescents were expected to focus intensely on the mastery of the scriptures and meditate with total concentration on Brahman. Scriptural studies completed, the young man then takes leave of the Guru, and with his blessings enters family life by taking on a bride. For her part, the bride too prepares for married life through the observance of a series of austerities, all intended to help her navigate life with her partner, always adhering strictly to Dharma. This then led me to make a brief reference to the four stages in a man’s life, which starts with Brahmacharya where the man observes strict celibacy and focusses entirely on God. Emerging from adolescence with the rigid discipline of a celibate life and a good grounding in the scriptures as well, the young man now enters married life. The woman he takes as his life partner is for her part mature herself, focussed largely on helping her mate adhere to Dharma in every possible way. 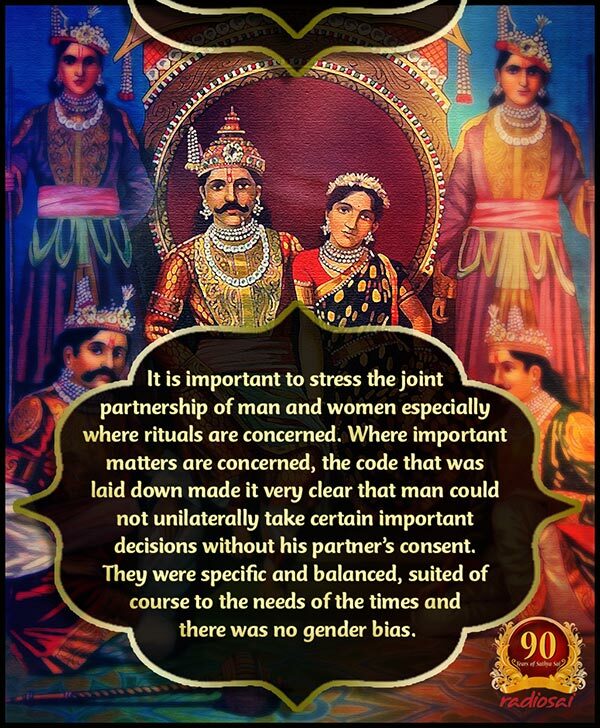 It is important to stress the joint partnership of man and woman, in the practical observance of duties, especially where rituals are concerned. Where important matters are concerned, the code that was laid down made it very clear that man could not unilaterally take certain important decisions. There is the famous story of how King Harischandra, trapped into a difficult situation by Sage Viswamitra as a spiritual test, demands that Harischandra give away his entire kingdom. While the King, a man of his word prepares to do so, the Sage reminds the King that his wife is not present and that without the consent of his wife, he has no authority to unilaterally give away his kingdom. Thus, where the scriptures and the codes for life were concerned, they were specific and balanced, suited of course to the needs of the times; what I am trying to drive at is that there was no gender bias. If bias crept in later, it was entirely due to system atrophy. People who complain about ancient tradition would do well to realise that any social or political system can atrophy if the basic rules are not observed in practice. Thus, though a country may be a democracy on paper, in practice, it may be money power in unholy collusion with other shady agencies that actually rules by proxy. If you think about it all, you would realise how vital the practice of Dharma is for all people everywhere, and at all times. Today, there are complaints about human rights violations all over the place and in so many different ways. And these violations take place in practically all countries. Why is that so? Because almost everywhere, people have stopped bothering about the observance of Dharma. Or take trade and commerce for that matter. Both are built on some basic assumptions. There are people who produce, commodities for example, there are people who act as distributors, either on a local or even global scale, and finally there are the consumers at the other end. For centuries, this chain, delicately built, operated reasonably well on the basis of certain well-understood principles based on honesty, trust and integrity. Yes, people on the supply side did make profit but they did not gouge; everything was within limits. Thus, the so-called Market Forces that pundits talk about implicitly worked within the framework of what I described as the Purusharthas. Today, excessive greed has suddenly taken over like an epidemic, and is causing huge disruptions all over the place. Just to make my point, let me mention that the other day, I was listening to a scholarly discussion over my radio on the price of crude oil in the international market. I do not know what exactly the price would be at the time this talk is actually broadcast, but right now as I am preparing this script; it is hovering around $135 per barrel. If you think about it, the price of crude has jumped about five times in about ten years! 1) If only supply and demand considerations were taken into account, the price out not to be $135, but about $85 or 90 at the most. 2) The extra has got into the picture on account of speculators, that is, people who are literally gambling and betting on the price of oil! This element has entered only in recent times and has completely skewed the entire pricing system. In practical terms, the limits of Dharma that used to be earlier observed though at times in a somewhat elastic manner have now been completely thrown to the winds; there are now no rules at all, and anything goes. If you think about the state of affairs in today’s society, be it in the education sector or the health sector or whatever, everywhere you find that all of a sudden, greed has infected people both rich and poor like a massive epidemic. Why? Because basically people have suddenly, for all sorts of reasons of their own, started putting Dharma on the back burner. That is why the issue of strict adherence to Dharma has become an urgent issue. I would like to take this opportunity to request each and every one of you dear listeners, to take some time off, reflect deeply on the matter and write to us about what you feel. The responsibility of the elders and the parents is very great in this. Take the students of today; no trace of culture can be seen in them; matters of the spirit and talk of the Atma raise laughter among them! A majesty of words, a servitude to tailoring - these have become the fashion. This is not genuine culture. I hope you paid careful attention to it. The point Swami is making is really simple. We all want Dharma in Society, because it is like a grand insurance. I mean who would like to live in a highly corrupt society, where one has to bribe one’s way from morning to evening? And yet, if one looks at the reports published by some international survey organisations, corruption has penetrated very deeply into almost all societies, in fact, quite heavily in an alarmingly large number of them. Actually, some societies have even crumbled, and such countries are now routinely referred to as failed states. In these failed states, there is no formal law and order; nor is there any formal educational, police, banking or postal system; everything runs, if at all, in a messy and informal way. It is too frightening to think about; most often, it is mob power that rules. I do not want to go into those gory details but would instead like to ask: “Whose job is it to sustain Dharma in a society?” In days when Purusharthas acted as the moral compass for Society, this question never came up. Why? Because each person quietly and either knowingly or unknowingly observed the basic rules, as a result of which, all was fine. But when everyone abandons rules throwing it to the winds, when everyone says it is not my job, when even parents and teachers say so, what else can one expect, other than the mess we find ourselves in? It is simple really. 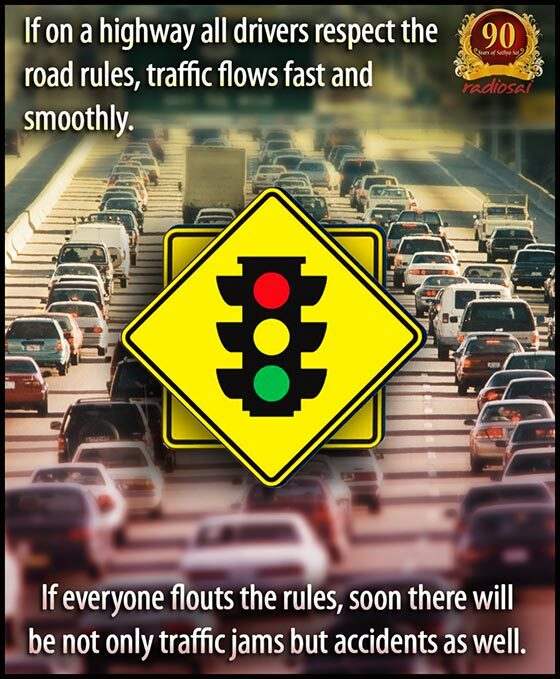 If on a highway all drivers respect the road rules, traffic flows fast and smoothly; but if everyone flouts the rules, soon there are not only traffic jams but accidents as well. More on all that next time. Meanwhile, I do hope you are able to cope up with this heavy dose! Heavy it may seem but vital it is, far more vital than we realise. I shall deal with that in my next, but meanwhile, please write back with your comments and questions, and if you have brickbats, we welcome them too!